CUPE 5362 is celebrating this event by providing a giveaway that was specially designed to commemorate the strike. These will be given away during outdoor events over the late spring/early summer. At the three General Membership Meetings (GMMs) being held in April, May and June we will be conducting 12 draws for pairs of tickets to the Rainbow Stage Strike! The Musical and one of the hoodies with the Strike graphic. Many of our Members have requested that we hold meetings during the lunch period. It took some idea planning to work out how to do this with our members based throughout the city. We have found that nobody likes to come to after work meetings, so we will trial some lunch meetings at MCC, the St. Boniface Unit and Screening Programs. We cannot hold lunch time meetings at the COPs because they do not have the staff available to be able to achieve quorum. At each of the three locations, we will be serving up pizza prepared by HSC CUPE members. (there is no cafeteria at Misericordia to supply Screening Programs and the St. Boniface Hospital food service is contracted out to non-union, for profit companies). As the COPs will not be able to attend the meetings, they will have an opportunity to participate so that they may be a part of the draws. As each of the members at the 3 larger sites have to come and attend the lunch meeting (during their lunch break – not on company time!) our COP members also have to make some effort to have their name entered into a draw. Please email Margaret at cupe5362president@gmail.com or go to our website at 5362.cupe.ca and use the feedback option on the main page to send us an email. Simply state that “you are a COP member and would have attended a meeting if able”. Your name will be added to the draw at the June meeting at the St. Boniface Unit. June 26th, Wednesday, St. Boniface – Admin Room – 1:00 – 2:00 – Raffle 2 gift bags. – St. B – we cannot get time over noon to book the room and only get an hour at a time. There have been several notices that there have been workers that are either non-union or are members of one of the other bargaining units doing the work of our bargaining unit. This is not allowed unless the Employer has requested this on a “one time” basis for various reasons (such as to facilitate an accommodation – of which we must comply under Human Rights). For example, RNs or RTs checking in a patient or scheduling an appointment, supervisors sending off patient information would be CUPE bargaining unit work being performed by others outside of our bargaining unit. As cut backs ensue and support staff not being hired, there is the temptation for those outside of our bargaining unit to do our work rather than hire another another employee or utilize a casual, even for a couple of hours. As there are further cuts coming with this government we need to ensure that our job duties continue to be performed by those within our bargaining unit. We are all facing workload issues due to cutbacks imposed by the current Pallister government and these workload issues will not go away. For some reason, the Employers (not just CCMB) seem to believe that they can dump more and more duties on their support staff as they face their own cuts. Some of these duties are above the pay grades of the employees of whom those duties were given to. Taking sick calls, scheduling vacation, sick relief, coverage etc. Scheduling vacation is a Manager, Supervisor or Resource Coordinator’s job. Clerks (regardless of pay grade or title such as “senior”) should not be taking sick calls (employee privacy). Only out of scope managers or the unit time keeper (should be Secretary) should know why you called in. Scheduling of staff should be done by either an out- of-scope supervisor or by scheduling clerks who do not work directly in the department. If you are doing work that you believe is above your classification please let us know. Many of you may have received mail from the CUPE Manitoba/PHCC campaign. in the mailing information was sent that specifies CUPE 204, mostly dealing with the WRHA and some information for Shared Health. Our information did not get placed into the envelopes. It seems that there was an error on the side of the company that stuffs the info into the plastic wrap. There will be an update sent to our Local 5362 members through CUPE’s system. If you do not receive this email by the end of the week please let Margaret know. Also, if you didn’t receive the package through Canada Post please let Margaret know so that one can be sent to you. 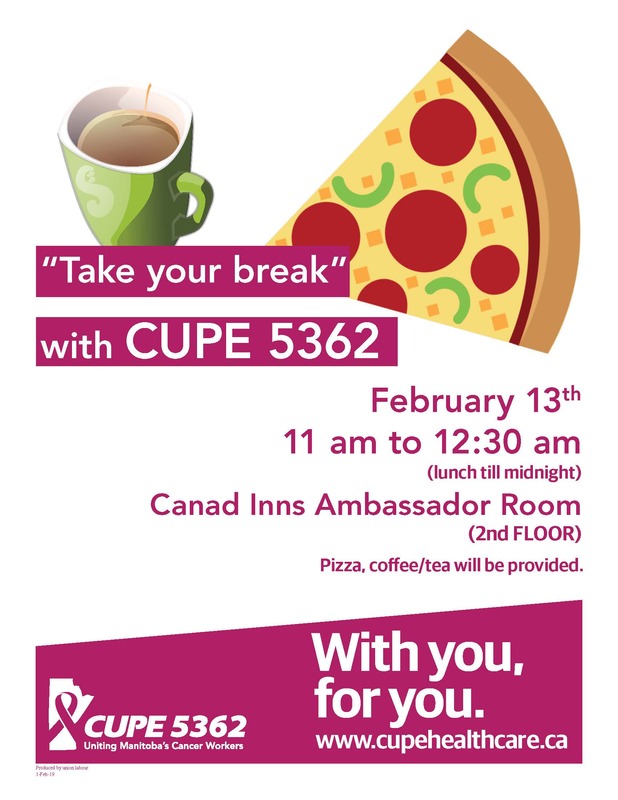 CUPE 5362 is inviting all members of the soon to be new Shared Health bargaining units to come and join us for pizza. Our CCMB and HSC CUPE members have a long history of working together and it’s time to renew and reinforce our shared objectives of working towards the best collective agreement that we can bargain. We will be there to answer any questions that anybody might have regarding Bill 29 regarding all of the information that has been floating around. For our CCMB offsite units, CUPE will be making way to various sites over the next few months. When the they are due to be out in your area we will let you know. They will be including Shared Health materials with them even as they visit the WRHA sites. We look forward to seeing as many of the Shared Health union members as possible! Home Care/Unit Assistants: The Pallister government has again tweaked Bill 29. There is a very large number of Home Care workers in Manitoba but they were not going to be a part of the Rep votes to chose a union as they were the only workers in the Community category so there was no other union to vote for besides their own MGEU. This was the situation that CCMB was in until last August 15th – CUPE was the only union for CCMB Facility. How to fix that? Cause all province-wide employers form a single bargaining unit under Shared Health. So, the government in this case decided that Community would be “direct care”, meaning that non-professional workers usually in the current Facility Support category will now be moved into the Community category. At CCMB we expect that this will affect 10 – 14 jobs including the Unit Assistants, Playroom Attendant and Senior Patient Assistant. Please see the attached bulletin from CUPE for more information and further details in the attached January President’s Report. Please see the dates for the GMMs for the first part of 2019. Further dates will be announced as we get closer to those meeting months in case they need to change for the Rep votes. All meetings will be held in the Manitoba Room in the HSC cafeteria and are from 4:30 – 6:00 pm. February 27, 2019; March 27th and June 26th. Please come one out to the meetings. This is your way of finding out up to the minute information and to make any suggestions. Let’s Talk Collective Agreement: CUPE 5362 will be hosting an event at CanadInns HSC on February 13th to bring forward the differences between the collective agreements for both Facility Support and Community. We will be serving up Pizza and will have laptops with both the long and short versions of the 2 Facility Support Power Points and we will also have a comparison of the Community Agreements. Watch for more information in the near future. Filipino Solidarity: Please see the President’s Report for the link to join a FB page made Filipino health care workers in Winnipeg. This page is open to all individuals but it is specific for those in the Filipino community where they can discuss issues at work in their language and with those who share their culture. If you have any questions please do feel free to contact someone from the union. We’ve uploaded the HSC Collective Agreement. It may be found on the Collective Agreement page. If you would like to have a more indepth copy of differences between the HSC Collective Agreement and the MGEU HSC Security Guards Agreement please do request it. If you wish to have a discussion or explanation please let one of your Executives know. We will arrange for either your Local President or one of the National Representatives to contact you. General Membership Meeting: December 14th at 4:30 pm. Canad Inns. – We will be holding nominations for the Secretary-Treasurer, 1 year term by-election. – We will also hold nominations for a 3 year Trustee (the three Trustees rotate from 3 yr to 2 yr to 1 yr so that we hold one election yearly. We will also be answer questions on differences between the two main collective agreements that are being viewed for the Rep Votes. We will be holding 2 draws! 1 – A $50.00 gift card to Tony Roma’s. (This is one of the left over cards from Local 1550). 2 – The left over hotdogs and pre-cook hamburger patties from Health Care Support Workers Week. We will also be holding nominations for Secretary-Treasurer and for the 3 year Trustee. Hot Chocolate Break: December 10, 12 or 14th (depending on site). We have completed our first year as a local after the separating of CCMB and HSC. Unfortunately with so many things happening in health care currently – unprecedented layoffs (every health centre in Winnipeg has seen losses in front line workers – including support workers), heavy workload and staff shortages in facilities without layoffs (such as CCMB), uncertainty as to what programs will eventually transfer where, raising the questions of “who will be my employer?” and of course “will I even have a job?” – things have not progressed as they normally would in a “new” local. We’ve had to hit the ground running. We know that our own Members are tired and some in certain departments are feeling the uncertainty of the changes. With so many questions with labour, legislation and the Rep votes we will be holding a “hot chocolate” break during the week of December 10th. Please see the attached notices. Later this week the notices will be going out to the units. We will be available to answer any questions that you may have. We will also have a comprehensive comparison of the MGEU and HSC collective agreements, one of which we will be using to base our bargaining on depending on how the support workers in Shared Health decide to vote. These comparisons are between the HSC CUPE Collective Agreement and the HSC MGEU agreement that represents the Security Guards. Our CCMB CUPE agreement and the HSC CUPE agreement are very similar. Theirs goes a little more into detail in regards to the specific needs and circumstances of a 24/7 tertiary care health centre. With the facilities that have been moved into Shared Health for bargaining there is no question that the largest CUPE agreement HSC’s and for MGEU it is the HSC Security Guard agreement. Members cannot chose which agreement of the winning union that they would like to be under. For example, If CUPE wins, workers cannot chose to be under the CUPE Prof Tech agreement which is the Childrens’ Rehab Centre PT/OT nor can they chose one of the MGEU Prof Tech agreements as these are not the agreements for Facility Support, our classification. Within the Facility Support category, we cannot choose the CCMB agreement for CUPE or the Eden Mental Health Centre’s agreement from MGEU as these agreements do not cover the largest number of workers of either union (CCMB’s agreement covers the 2nd largest number of workers). There are a number of members who have asked for a more comprehensive comparison between the CUPE and MGEU agreements. There has been one made and it is currently going through a double check for accuracy. We will be serving up refreshments over a coffee break. For any members who did not receive their lunch bags, shirts or other items there will be some available as we got to all of our sites. This will occur on during the week of December 10th. The GMM will be held on the same day as the “come and go break” on Wednesday, December 12th at a meeting room book at CanadInns. Due to the holiday drop in event, we can not use the Manitoba Room in the HSC Cafeteria for the meeting so we will be in Canad Inns HSC. More info will be posted. The GMM will start at 4:30. Along with the regular business, we will be taking nominations for the now vacant Secretary-Treasurer position. If you wish to be nominated but cannot make it to the meeting, please contact Margaret so we can go through the process for that situation. We will also be available to answer questions regarding the Rep votes and any updates if there are any. We will be having a draw for a $50.00 gift card for Tony Roma’s. That is the last of the cards that we kept from Local 1550. As always, if you have any questions or concerns please let us know by emailing cupe5362@gmail.com. We hope to see you out at one of the Holiday Drop in events! If you are a CUPE 5362 Member and with to receive the full email that went with this release please sign up using the form on the right side of this page. HCSW: Thank you to all who came out to grab a hotdog, lunch bag and other “swag” for HealthCare Support Workers week! We served up hotdogs to MCC, St. B and Screening Programs and wraps were delivered to our 4 COPs and evening staff. It was a bit chilly but the bbq was hot. I would like to thank our Executive Members Collette Lafreniere Thompson, Alexis Haderer and Ally Pham for helping out as well as Tara Lancaster from St. B and Nicole-Dane Novelle from BreastCheck for coming out.Your help was so appreciated. Of course, Yewch’s Champion Dogs were champions. They went above duty helping us out by helping with our set up as well as their own! Secretary-Treasurer: Christina Muise has resigned from her position as Secretary-Treasurer. We thank her for all of her hard work, she will certainly be missed on the Executive. She will be remaining as a Shop Steward so she will be attending a member representation meeting her and there. We will need to elect a new Treasurer. The nominations will take place at the December general meeting. If you wish to be nominated please either attend the meeting or request someone who is attending the meeting to nominate you. If you cannot attend the meeting but someone nominates you, please have forwarded your written acceptance of the nomination. If you have any questions please email the local for clarification. The “books” are not as frightening as some may think. We have spreadsheets made up to help with the math. Usually, this positions takes about 30 – 60 minutes of work a week outside of the Executive and General meetings. CUPE does offer training, of which the next Financial Officer’s workshop is in January. Civic Election: You’ll note that the General Membership meeting has been moved to November 1st. Normally we would have scheduled it for October 24th but this is the date of the civic election. We decided to move our meeting so that it wouldn’t interfere with anyone’s ability to get to their polling stations and casting their vote. If your co-worker has not received this email, please have them email their email address to cupe5362@gmail.com . Please send your home email not a work email. We hope to see you out at the General Meeting! Bill 29 Update: Please see the October 2, 2018 update on Bill 29. Since the last report there have been a number of changes! The most important change is finding ourselves a part of the representation vote for union representation. Since the notice from CUPE was sent out in August, efforts have been made to contact all of the members of Local 5362. Thank you to all of you who took the time to talk to the various callers and to those who called back. When the question “Will CUPE have your support?” is asked, please be honest regardless of your answer being yes, no or I don’t know. This is important so that we can gauge how we are doing. Please feel free to engage the callers with conversation. If you know that some of your co-workers plan on voting “no” or unsure of how to vote, please let the caller know and if you know why they feel that way please give us that information. This information is important not only for this vote, but when we win this it is important as we will know what areas need work and need to be addressed. There will be more calls throughout the coming months as more information is received. In the attachment “Bill 29 Rep Vote…” the latest update from the government is detailed. Please know that this has not yet passed legislature and there is doubt that this list is finalized. There are some expected changes and additions expected to occur yet. However, it has been confirmed the CCMB will be voting in Shared Health as expected and will be joined by HSC, Diagnostic Services and Childrens’ Rehab. There is more information in the President’s Report. CUPE wearables and items: These are all allowable at work! There have been some questions as to wearing or using our items at work. This allowed where a specific uniform is not required. In any work area that you are allowed to wear your own clothes, these shirts are allowed even with the logo showing. For those who purchased the light jacket which shows the logo on the front and back, this is allowable. We chose these items specifically without hoods and in such a design (no low v-necks) so that they would conform to the CCMB dress code policy. Our lanyards and pulls are also fine. Collective Agreement Questions: This month the 10% WCB top-up and notice required for medical appointments are addressed. They are added to the President’s Report. If you have any questions that you believe should be added to a future report, please do let us know! Health Care Support Workers Week (HCSWW): The PHCC has sent a request to the Government to proclaim the week of October 8th as HCSWW. The proclamation has not yet been received but we are going ahead with our plans anyway. We will be providing a BBQ for the MCC, St. B and Screening Programs/Hope sites. We will be delivering wraps to the 4 Community Oncology Program sites. Please see the attached notice. General Membership Meeting (GMM): Please see the attached notice for the GMM. We have worked out an idea of streamlining the meeting so that we can have more time for questions/answers and topics of Local interests and concerns. As always, if you have any questions or concerns please contact any of the Executive. This will also be placed on the website. Please share with your co-workers who may not have received the email – and remind them to submit their email address. We find that many people are not looking at the boards and are missing the bulletins (except Human Resources – they are reading what is placed on the boards). To add your email please send it off (using your non-work email) to Send Mail . On the side of this webpage, there is a widget that you may use that will automatically add your email to our Mail Chimp list. If you do not have a home email or internet access at home, please let us know so that we can provide a different way to gather information. Over 100 of our 282 members came out to pick up shirts during this last week. Thank you for coming out. We will be back out in October as this year we will be celebrating Health Care Support Workers week. Please watch for that information. Along with new items, we will have the shirts, lanyards and tag pulls available for those who haven’t yet picked anything up. Place: Manitoba Room – HSC Cafeteria (along the left hallway past the cash machine). The notice is a bit short – we were having difficulties with receiving approvals for our LOAs. All of the sites should have received their copy notices and they should be on the boards for your site. – due to few members, your shirts will be brought inside to you. (We won’t need to set up a table – this time). Even if you did not come out to choose a size in June, there will be plenty of shirts to choose from. Due to the rules that the Provincial Health Labour Relations Service (PHLRS) has placed on the unions regarding the upcoming Representation votes, we are no longer allowed to set up our “give-aways” inside any of CCMB’s properties, so we will be setting up tables on the sidewalks. As always, if you have any questions, please feel free to bring them. Our General Membership Meeting on September 26th will be held in the Manitoba Room in the HSC Cafeteria at 4:30 as normal. Thank you to all of the Members who came out to choose a t-shirt size. Each site was visited during the week of June 18 and over 100 people attended. For those who didn’t come out during this time, we will have lanyards, pulls and a few cups available when we hand out the shirts and a few other items. We have ordered enough shirts for all members, so even if you did not come out for a t-shirt size, there will be shirts available. We’re hoping to get those out to the members by the middle of September! Job Descriptions: Thank you to those who sent their job descriptions to us. We are trying to gather as many of the descriptions as possible as it seems that most of them that we have are from 10 years ago (or more) and we know that duties have changed. Some of the descriptions that we’ve seen have duties in them that belong to higher classifications and may need to be amended to reflect the job or may need to go through the Joint Job Evaluation Committee (JJE). Please know that the job descriptions are information that the Union is entitled to and Human Resources does give us the descriptions when we request them, however it is often easier and more time effective that get them through our Members. All employees should have a copy of the job description that they signed. Seniority and mobility within all 7 of our Winnipeg sites: We have received a few questions as to how our seniority works between all of our sites. Below, an explanation of how our seniority works between the sites (and a few other items) is attached below. Collective Agreement Questions: With each Monthly news email an article within the Collective Agreement will have a small write up. These articles will be chosen based on how many people asked about that article, an issue with management not following it properly has arisen or there had been a special request to have it explained. In this email the topics of CUPE members replacing/covering for their supervisors when they are away and responsibility pay and how and when an employee may be told that they have to go to a different site to work. These are included in the President’s Report. Greetings to all members of CUPE Local 5362. Please see the information below. There are several attachments linked at the bottom. Please share this email with your co-workers. Some of them may have signed up for the emails but might not have added this to their “safe” list and the emails are going straight to their spam boxes. General Membership Meeting – June 20th, 2018. Manitoba Room (HSC Cafeteria) at 4:30 pm. As of this time we have not heard anything regarding the possibility of having a representation vote at CCMB or when they will be held throughout the province. We are noticing the difference of this bill. Attached you’ll find a notice for our t-shirt give away. We were not allowed to book a table in the MS Mall outside of the CCMB doors. HSC Volunteer services will not allow bookings to unions at this point and time. To be able to book the Manitoba Room in the HSC cafeteria we had to stress the fact that this is CCMB and we will not be advertising this throughout HSC. Communications will become tighter. We will be doing more communicating through email rather than posting. Again, the province won’t allow campaigning on facility sites and the employer can take down any posts that they feel are offensive (such as the Union asking members to come forward with work shortage hours. There are bonuses to using email. With large departments like Nursing, it is often difficult to get the information out to you, this is more environmentally friendly and it is definitely cheaper. With budget cuts and vacancy management our staffing levels are not keeping up with the increase of workload as cancer diagnoses increases. We have a heavy workload form that had been developed by Local 1550 but we find that it isn’t giving us the information that we need. The form will be revamped, however until the new one is done please continue to use the old form. Please note: No heavy workload forms go to management! All forms are to be returned to CUPE and we keep them. When information is taken to management we total up the responses and take the information to management as a statistical tool. (IE – during the month of March, on 10 occasions this department was short ?? number of staff ## of times.) We do not share the actual forms with the managers. That is an MNU thing, not a CUPE thing. There are some changes coming with the Workplace Health and Safety (WHS) committee at CCMB. This is a legislated committee and reports to Work Safe Manitoba. There are plans to increase the number of committees due to the size of the St. B unit and the Community Oncology Programs as well as the increase of staffing at the Screening Programs building. We have a volunteer to represent CUPE on the committee that will be for St. B and the COPs. We will be looking for someone from Screening to sit on the committee that will be for that building and the Breast and Gyne Centre of Hope. These meetings are held during the workday and you will be relieved of your regular duties to attend the meetings while receiving pay. We will be giving all of our members a t-shirt with our logo on it. Rather than just ordering a bunch and guessing how many of each size that we will need we have chosen to have Members come and choose a size. Attached is a list of the dates and times that shirts will be available at each site. Please bring your ID badge or your EEID from your pay statement. (We are collecting EEIDs to double check those that come with the dues. As we will be using electronic voting we will need those in the future). We are ordering 300 shirts, so after the specific sizing, we’ll order an assortment of sizes until we reach the 300 so if you can’t get to the sizing you will still get a shirt. We will also be giving away new lanyards and badge retractable pulls. When the COPs transferred to CCMB in the fall they all received cups as did the Cervix and Colon Check members. We will be bringing what is left of our cups to the MCC and St. B t-shirt days and setting aside cups for Breast Check and a couple of new or transferred hires at the COPs. Amounts are limited as these cups are from past inventory from 1550. Jackets – We will also have jacket samples on hand. They will be embroidered with with our logo on the front and on the back. We won’t be giving these away. They will be sold for $90.00 each, based on ordering 10 jackets. We are asking for everyone to submit a copy of their job descriptions to us. You are not breaking FIPPA regulations by doing so. We are allowed to have these. There seems to have either been a lot of changes to some of them and some descriptions we simply do not have. It is hoped that with your help we can update these faster than asking Human Resources for a couple at a time. You may email these to cupe5372president@gmail.com . CUPE Local 204: Stop the Health Care Cuts campaign – This is a campaign being held throughout the province. Local 5362 had been offered to add our local number to signs, but we chose to not be involved with this campaign as one local in an area with the campaign is enough. It gets confusing otherwise. We do have a campaign for our members coming up that will be unveiled during the later part of summer. (or earlier). Until then, please support Local 204 by placing a sign on your lawn. These healthcare cuts affect all of us. To get a sign you can sign up at http://cupe204.ca . Hopefully we’ll see you out at a “t-shirt day”. Please see below the bulletin from CUPE regarding Bill 29, the Health Sector Bargaining Unit Review Act. Please note, under the section, “How does this bill affect me”, 1st bullet, Shared Health is mentioned. CancerCare Manitoba is classified as a provincial health care employer as is Shared Health. Please note that CCMB is NOT a part of Shared Health and at this time there is no indication that CCMB will become a part of Shared Health. Right now we are not certain how this is going to affect CUPE at CCMB. We do not have multiple unions representing the same classification of workers, which according to the Act is what would trigger a representation vote, However, we have seen this government change things on a whim so we will have to wait and see what happens with this. Stop the Cuts signs: Please join in solidarity with our friends at CUPE Local 204 by supporting their Stop The Cuts sign campaign. They have yard signs and other materials that can be used to further their push to get information out regarding the huge cuts to health care under this government. Please visit cupe204,ca for more information. As we have many members who live outside of the Winnipeg, CUPE Local 4270 who represents the Support Staff in the Southern Health Authority also have signs available for anybody interested who live in the rural areas. CUPE 5362 will not be putting out our own signs for Stop the Health Care Cuts campaign. With both Locals 204 and 4270 providing signs for the rural and urban centres, the Executive of 5362 decided support their campaigns but not to actively participate by printing up signs of our own to distribute. Coming Soon: While we won’t be participating in the Stop the Cuts sign campaign, we will be doing our own campaign that will be specific to support staff. Currently we have not had the job deletions seen throughout the WRHA, so our campaign will be geared more to our circumstances of vacancy management and constant working short. (These are also forms of cuts). Watch for more information in the near future and please do support Local 204 and 4270 with their sign campaign as these speak for all of health care in Manitoba. FYI – The next General Meeting is scheduled to be on Wednesday, June 20, 2018. Notices will be going out at the beginning of June with the time and place. If your co-workers have not received this bulletin, please let them to know to pass along their email address (personal, home email. We will not send these to any work email). This is also posted on the website at 5362.cupe.ca . This is more important now than ever as we will not be able to post much information regarding our campaign and and any kind of representation votes on our bulletin boards or through hand outs in the employer’s property. If you have any questions please contact one of our Local Executives. Every year we have a lot of questions regarding vacation especially as the province works towards standardizing policies within the health care organizations. They are working towards facilities with similar language within the collective agreements to follow the same processes. For CCMB this means that there have been a lot of changes as for many years they did vacation differently, mainly due to our Monday to Friday, days operation. However, we do have people who work weekends and evenings and in many ways following the collective agreement as written benefits us more than hurts us. This is seen in the taking vacation on a general stat holiday and placing that stat into the bank. For those who wish, this can be paid out at the end of the year whereas vacation normally has to be taken in time. Single day vacation is now listed on the annual “vacation rules” that each manager is supposed to place with the vacation entitlements. For a very long time there have been some managers who did not allow their staff to take single day vacation but other units were allowed to. CUPE views this as an instruction to the managers that once the week blocks of vacation have been chosen then employees are able to book single day. Everyone. If you have any difficulties with vacation please let us know. If you have any questions please do contact us for clarification! We have added a few new pages to the website. On the Education page we have added a “fillable” form so that you can fill it and email it to us. We’ve added an Expense Voucher to the new “Forms” page. We have a new Local number!! As requested at the August meeting we asked CUPE National to change our local number. They heard us and they agreed. CUPE Local 1550, CCMB unit is now officialy CUPE Local 5362! There have been a number of HSC staff stating that HSC and CancerCare Manitoba are merging into one employer. Please note, this is NOT true. HSC is becoming a part of the province wide Shared Health Services of Manitoba (SHSM) along with Diagnostic Services of Manitoba (DSM), and emergency services such as ambulance/paramedics. CancerCare Manitoba is not a part of this. CCMB will remain a province wide organization as it always had been. It will sit at the provincial planning tables with SHSM and will continue to be in partnership with all RHAs within the province. This website will no longer be updating with Local 204 information. They now have a Facebook group that you can go to for your information. Please search FB for Local 204-HSC. The former Local 1550 Website has been archived and can be found under the “About US” tab.